The Elwood baseball team is ready for a solid season on the diamond. 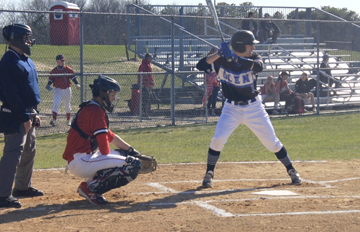 Maintaining control and building momentum on the baseball field will be the focus for the Elwood-John Glenn varsity team as they look forward to the rest of the season. The Knights battled to 7-6 victory against Huntington on Monday. Head coach Matthew Rocchio feels the team has come together over the past weeks and played well so far, with a record of 2-1in league play. This season the boys have concentrated on reducing errors on the field that allow the opposing team to get on base or score. It is crucial that the team’s pitchers are throwing strikes and fielders solid on defense. Rocchio said the Knights’ batting lineup for the season is starting to take shape, and he feels can deliver at the plate. Junior Nicholas Aufiero batted .330 as a sophomore last season. The team was fortunate enough to practice outside at the start of the season, something that hasn’t always been possible with cold weather. This allowed coaches to evaluate players in a game mentality early on. Rocchio said players break up into groups at practice, and work on specific drills for their position before they come together for team games. Although the team is mostly underclassmen, Rocchio feels the boys possesses the talent to go far. Many of the athletes worked hard in offseason, voluntarily practicing two nights a week in the winter. Matthew Polestino has already hit a homerun this season, and has proven himself as a great pitcher and outfielder. Coming out of the bullpen, Rocco Fratarcangeli will play a key role as the team’s closer. Nicholas DiDiego, a three-year varsity veteran, began as a catcher, but transitioned to first base and pitcher to utilize his strong throwing arm. The team is also expecting big things from Nicholas Aufiero, who batted .330 as a sophomore last season. This year, Glenn welcomed assistant coach Billy Riedel to the staff. The former Knights catcher has extensive knowledge of the game of baseball. This is Rocchio’s third year with varsity after coaching junior varsity and at Briarcliff College. In that time he’s learned when to rest his players. The Knights will play an average of three times a week for a total of 20 games this season. Each game brings a new challenge, with different players, abilities and styles. “We don’t know what the other teams are doing right now, all we can really do is play our own game and see what happens,” Rocchio said. Glenn is eager to take on Harborfields in a rivalry game that will played under the lights of Greenlawn Park on April 16.